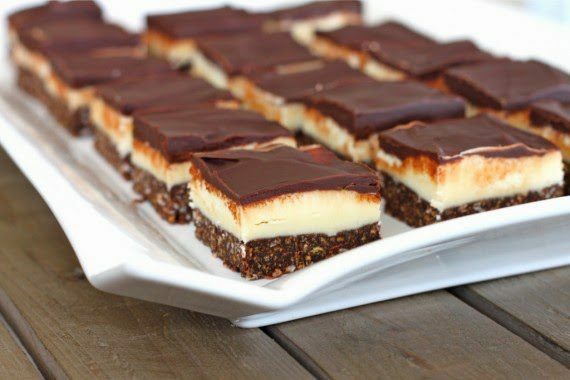 Nanaimo Bars (N.B.s for short) are one of Canada’s favorite desserts. The city of Nanaimo, British Columbia claims these squares as their own, saying on their website that it all began when a Nanaimo housewife entered a recipe for chocolate squares in a magazine contest some 35 years ago. 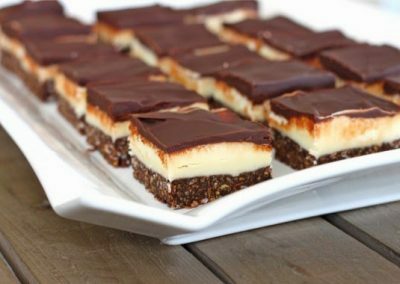 She called her recipe ‘Nanaimo Bars’ and when she won the contest, not only did her dessert become popular throughout Canada, so did the town they were named after. These no-bake, three layered bars are famous for a reason, they are fabulous. They start with a crumb base, followed by a layer of light custard buttercream, and the finale is a glossy layer of chocolate. (The first 6 ingredients are for the bottom layer) On top of a double boiler, combine 1/2 cup butter, white sugar and cocoa powder. Stir occasionally until melted and smooth. Beat in the egg, stirring until thick, 2 to 3 minutes. Remove from heat and mix in the graham cracker crumbs and coconut . In a 8x8 inch pan, put parchemin paper (enough to overlap on all 4 sides). Press the batter down in the pan to form the first layer. For the middle layer, cream together 1/2 cup butter, heavy cream and the vanilla pudding powder powder until light and fluffy. Mix in the confectioners’ sugar until smooth. Spread over the bottom layer in the pan. Chill to set. Spread over the chilled bars. Let the chocolate set before cutting (in the fridge for half an hour). When the chocolate has set, lift the whole thing out of the pan by lifting with the parchment paper. Cut about a 1/4 inch trim around the four sides, and then cut squares, making sure you clean your knife frequently so the bars are clean looking.